According to Tim Gideon at PCMag, "...the attractive Senta-40 Wood Headphones by C. Crane offer full-bodied bass response and an overall strong sonic performance at a low price". We made the Senta-40 wood headphones to look like they sound: smooth, clean, clear and natural. 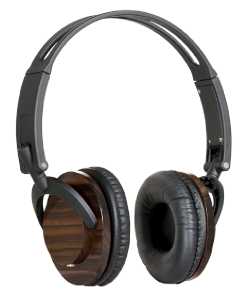 With 40mm drivers offering a full range response and great stereo imaging, the Senta-40 Wood Headphones produce high quality audio, without the high-price tag or marketing hype. Real wood housings, soft ear cushions, a lightweight headband, and a foldable design provide beauty, comfort, and portability to seamlessly fit into any lifestyle. When it comes to audio, we all have slightly different preferences. So when everyone here agreed that these wood headphones sound incredible, we began to get excited. When they out performed "industry standard" studio monitor headphones, our excitement was justified. High fidelity 40mm drivers produce a surprisingly flat response, which makes them great for musical and home studio applications. The lows are solid, yet not overbearing. The upper frequencies are detailed and smooth. Superior spatial imaging puts you in the middle of the music. The lightweight, adjustable headband doesn't squeeze your head like other headphones. The headband is also extremely flexible which makes it almost impossible to break. (see the image on the right.) Ultra soft ear cushions offer long lasting comfort. 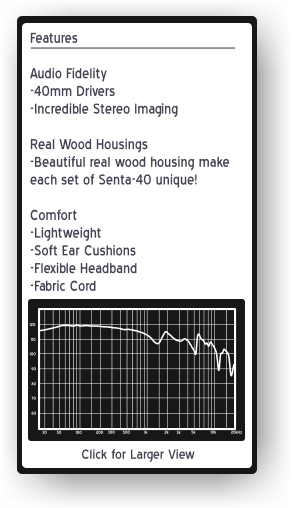 Whether you use headphones casually or for extended periods of time, the Senta-40 Wooden Headphones provide the comfort you're looking for. The Senta-40s feature a folding design with a detachable fabric covered cord allowing for convenient storage and portability. We've also included a durable carry case for added protection on the go. If you're a fan of high quality audio, and you appreciate comfort, the Senta-40 Wooden Headphones may be just the set you've been looking for. Perfect for mobile lifestyles as well as professional applications.